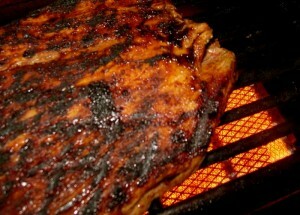 Flank steaks are the ideal centerpiece for entertaining; they are flavorful, easy to prepare and people-pleasers. In the following recipe, much of the prep work involves making the marinade and rub, which must be done in advance; a blessing for cooks who’d rather partake in festivities than work in the kitchen. 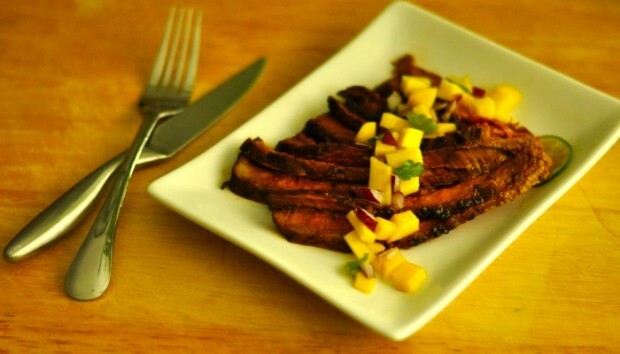 A lengthly marination and high cooking heat are keys to a delicious flank steak. The cut of meat cooks quickly and accommodates a laid-back eating schedule, tasting as great at room temperature as it does hot off the flame. Flank steak is mindful of the expense of beef and watches your bottom line. The meat is best enjoyed sliced thinly against the grain, so it stretches further accomodating a larger group. To further extend your dollar, consider serving the steak and salsa alongside warm tortillas and sour cream. Keep in mind flank steaks are best served rare to medium rare; they toughen up the longer they are cooked. If you prefer your meat well-done, I’d select a different cut of beef, such as a delmonico. 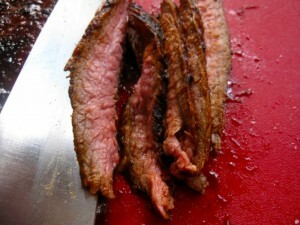 Slice cooked flank steak into thin strips against the grain. Commemorating the Fourth, I amped up the heat in the following recipe by injecting it with flavors from south of the border. Ground chipotle chili pepper, which is available in the spice section of most groceries, delivers the smoky bang. Use it with discretion according to your personal pain/pleasure heat index. The dry rub works overtime also seasoning the marinade. The spicy rub hits the base notes, lending a flavorful crust, and the cooling sweet mango and piquant flavor of lime hit the treble. Herbaceous cilantro and redolent red onion balance the composition; a symphony of flavor. The perfect side dish for this recipe would be Southwest Roasted Potato and Corn Salad, bundling a potato and vegetable salad together. Penning these words, I wipe the sweat from my brow in this sweltering heat. The addition of tequila and orange-scented triple sec to the marinade was impulsive, momentarily quenching my thirst for a margarita – momentarily. Did I mention the tequila and triple sec used in the recipe also work overtime as libation for the chef? It may be noon but, as the song goes, it must be happy hour somewhere. Happy Fourth! To make a marinade, combine juice, 1 tablespoon of dry rub mixture (reserving the rest), triple sec and tequila. Place meat in a non-reactive dish, or gallon-sized plastic bag with a secure seal, and pour marinade over beef. Marinate 12-24 hours, refrigerated, turning once. When ready to cook, remove meat from refrigerator and allow to come to room temperature. When ready to cook, discard marinade, pat meat dry and massage remaining rub into meat. Prepare charcoal or gas grill to high heat, or preheat broiler in oven and position rack as close to heat source as possible. Grill or broil 4-6 minutes on each side for rare (depending on heat of flame and thickness of beef); ends will be medium to medium rare. Let steak sit 10 minutes before slicing into thin, diagonal strips against the grain. Season to taste with kosher salt, and serve with mango salsa. *I used the Looza brand of juice, which has a rich intense flavor; pineapple juice may be substituted. Combine brown sugar, 1/4 tablespoon ground chipotle, cinnamon, garlic powder and salt. Taste and add additional chipotle as desired. Combine mango, lime juice, cilantro and onion.